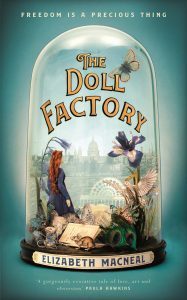 Set in Victorian London amidst the opening of the Great Exhibition, The Doll Factory follows the lives of three people trying to make their way in the world. Silas Reed is a taxidermist with a shop of curiosities who began life outside of London in a pottery factory. He likes to collect things: skulls, skeletons, scraps of life he can preserve. It was his collection of skulls that helped him sell his way to freedom, London and his shop. He is a lonely man of great ambition who smells of decay and chemicals. Albie is a street urchin whose teeth, all but one, were knocked out by a carriage. He finds dead animals for Silas, he sews underskirts for Mrs Salter’s Doll Emporium and lives with his sister in the whorehouse. Iris, one of the twins at the Doll Emporium always treats him with such kindness even when snapping the flea eggs on his doll skirts. Iris, whose collarbone broke at birth and heeled twisted out at an angle, used to be the ugly twin until her sister caught smallpox. Since then they have been lucky enough to find work at Mrs Salter’s Doll Emporium, painting the delicate porcelain faces and sewing the outfits for custom ordered dolls, often made in homage and likeness to dead children. Their life is one of drudgery from which Iris secretly wishes to escape. She sneaks out of bed at night and paints using tools it has taken her months to save for. She paints in secret because such longings are improper. Her wild desires threaten the safety of their respectable lives. When Iris is introduced to Silas by Albie, their lives all begin to turn in unusual directions for Silas works for several of the Pre-Raphaelite brothers who use his animals as still subjects for their work. When one of Silas’s pieces rots, an angry painter loses his model and forces Silas to think of a way he might endear himself once more to the gentleman. It puts him in mind of Iris, with her beautiful red-hair and her unusual frame. She might be a possible model for the painting the gentleman is working on. Though Silas regrets speaking the moment he says her name, the suggestion is made and all their lives change irrevocably. It’s a fun novel to read, teasing out painful character histories as well as interesting real history about the Great Exhibition and the Pre-Raphaelites. I’m not hugely versed in the period but Iris’s gentleman painter, Louis Frost, embodies many of the interests of the famous founders of the movement not only in his painting but also in his lifestyle. Elizabeth Macneal’s portrayal of Iris forces us to look again at what was possible for women of the time. 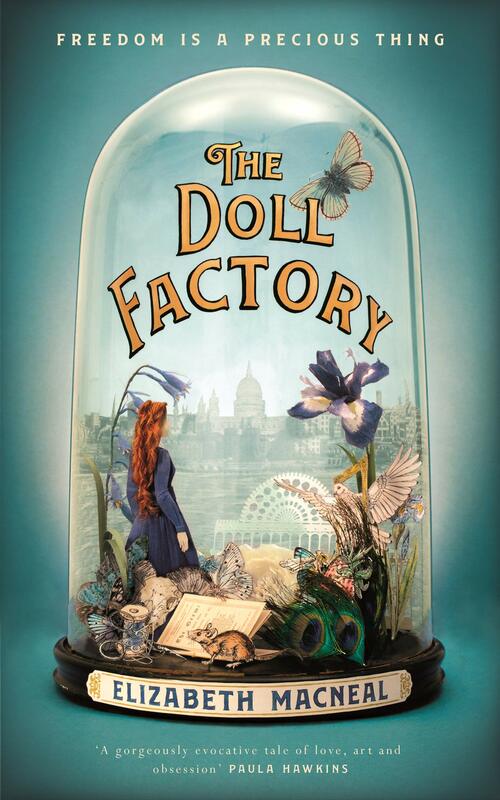 The Doll Factory is uplifting and dark, exploiting all aspects of the period and painting a picture of Victorian London that is bound to tantalise. Next week I’m reading Loyalties by Delphine de Vigan.